﻿For plentiful stripers, head up to Lake Texoma. ﻿﻿﻿﻿﻿﻿﻿﻿﻿Chris Carey revs the big outboard as he screams, “It’s a twin tornado!” We streak across the water, heading straight for the storm. Seconds later we’re slinging white buck-tailed jigs tipped with plastic worms into the water beneath the double-helix swarm of circling seagulls. The birds are there to pick off shad pushed to the surface by marauding striped bass, and our lures look just like small silvery fish swimming for their lives. My second offering is almost back to the boat, and I’m lifting the rod tip and reeling faster, preparing for another cast, when a monstrous strike snaps the 20-pound-test Big Game line. “That’s the fish we’ve been waiting for,” Carey exclaims, quickly tying another lure on my line. All day long I’ve been catching Lake Texoma stumps while Carey and my wife, Zoe Ann Stinchcomb, boat stripers up to 30 inches long. This is my chance to do the same. I cast, reel and BAM! — a big striper nails the lure and sets the reel to singing. What the late Ed Bonn did, while a fisheries biologist for the Texas Parks and Wildlife Department, was bring striped bass from South Carolina and develop the procedures for rearing and stocking both striped bass and hybrid striped bass (a cross between native white bass and stripers) into fresh water. Bill Carey also owes a debt of gratitude to Jack Harper, a biologist with the Oklahoma Department of Wildlife Conservation, who stocked 138 adult stripers into Lake Texoma in 1965. ﻿Zoe Ann Stinchcomb shows off a 30-inch striper that was feeding under a "twin tornado" of circling seagulls. Working birds are usually a sign that stripers have pusched shad to the surface and are actively feeding. Cast into the melee and hang on. Striped bass (or stripers) are a marine species that, like salmon, migrate from the sea into fresh water to spawn, then return to the ocean. That process was interrupted for the first time in South Carolina in 1941, when the giant Santee-Cooper Reservoir was impounded, trapping striped bass that were in the river to spawn. Biologists expected the fish to die, but they lived, and a popular freshwater fishery was created there. When Texas went on a dam-building spree following the drought of the 1950s, Texas went from a state where most fishing took place in rivers, creeks and stock ponds to a fishing paradise with more inland waters than any other state except Alaska and Minnesota. Ed Bonn saw the striped bass fishery in Santee-Cooper and decided to try to replicate it in Texas. In most Texas reservoirs with stripers, the fish do not reproduce, and continued stocking is required to maintain the fishery. Lake Texoma is different. The waters of the Red and Washita rivers provide stripers with just the right conditions for spawning, and the fish are so prolific that the daily bag limit on Texoma stripers is 10 per day (only two of which may be more than 20 inches long), double the statewide limit. Texoma is one of about 10 reservoirs in the United States where stripers are able to naturally reproduce. In April and May they run up both the Red and the Washita in huge numbers to spawn. The Oklahoma state agency is researching whether striped bass, like salmon, return to their natal river to spawn. Rises on the rivers appear to stimulate and facilitate spawning. 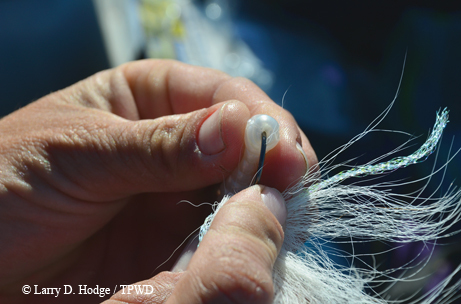 Striper eggs must remain suspended while hatching, so flowing water during the spawning season is critical. 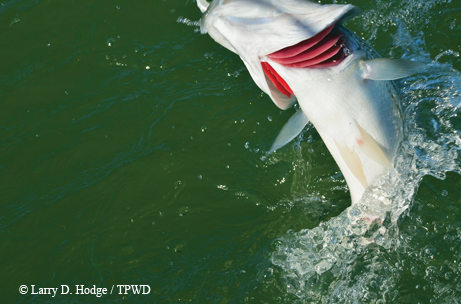 Reproduction in Lake Texoma is particularly high, because the fish have two rivers to spawn in. A high rate of spawning is necessary to sustain the population, since an estimated 50 percent of the fish aged one year and older die annually. Striper fishing is big business on Texoma, which lies on the border between Texas and Oklahoma. Bill Carey’s Striper Express Guide Service is one of scores on the lake. While other Texas lakes offer striper fishing, “Texoma is the grand lady of them all,” Bill Carey says. Texoma’s status stems from the fact that striper fishing is good all year long. ﻿﻿Zoe Ann Stinchcomb fishes for stripers near a stump field at Lake Texoma. Stripers hang out around the stumps and attack shad. Zoe Ann and I fished in January after an unusually cold December had chilled the lake into the upper 30s. By late January the water had warmed into the low 40s, and Chris Carey knew scattered groups of fish would be moving into shallow water on sunny days to feed on shad. “There’s only one reason for them to be in water 10 to 15 feet deep, and that’s to eat,” Chris Carey says. Due to the mild weather, we fished a typical March pattern, casting our Roadrunners into stump fields on the edges of islands and creek channels whenever the fish finder marked fish below us. 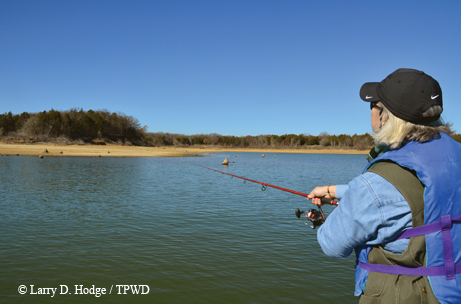 TPWD Inland Fisheries biologist Bruce Hysmith manages the fishery on Lake Texoma, and he offers some advice on where and when to find those right places. In June, action switches to the open water as stripers form huge schools roaming the lake looking for unfortunate balls of shad. ﻿Chris and Bill Carey prefer to use artificial baits for stripers. Stripers are light-sensitive and will go deeper as the sun gets higher, but they stay in schools. Hysmith advises starting your summer search for stripers around daylight near Denison Dam, where you may find schools of fish on the surface. Seagulls that have spent the summer annoying beach-goers on the coast redeem themselves by coming to Texoma in the fall to act as fish-finders, joining the ones that reside there year-round. Anglers watch for flocks of gulls circling over the water, and when they start squawking and diving, it’s striper-catching time. During feeding frenzies the fish can make the water boil as they pursue and gobble up fleeing shad near the surface while the birds join the feast from above. Almost anything thrown into the melee — chatter baits, poppers, Rat-L-Traps, slabs — will catch fish. Striper fishing brings pleasure from the hook-set to the plate. The fish that Zoe Ann and I catch illustrate another point Carey makes about stripers. Striped bass (Morone saxatilis) are native to the Atlantic Ocean, but thanks to stocking by federal and state wildlife agencies, they can now be found along the California coast and in more than 30 states. Striped bass played an important part in early American history. Pilgrims of the Massachusetts Bay Colony (think Captain John Smith) wrote of them being so numerous in creeks that one might think it possible to cross by walking on their backs. A tax on the sale of striped bass funded the first free public school in the colonies. Overuse of the fish as fertilizer led to passage of the first conservation law in 1639, which forbade such use. Stripers have been transplanted to new waters for more than 100 years. In 1879 and 1881, New Jersey striped bass were taken by train in wooden barrels and milk cans and stocked into San Francisco Bay. Using the methods pioneered by Jack Bayless of the South Carolina Wildlife and Marine Resources Department, Jack Harper of Oklahoma and Ed Bonn of Texas, TPWD freshwater hatcheries produce millions of striped bass fingerlings each year for stocking. They’re put into reservoirs with ample open-water habitat more suitable for stripers than for species such as largemouth bass. Early on, lakes stocked most often included Amistad, Buchanan, Buffalo Springs, Canyon, Granbury, Lavon, Livingston, Possum Kingdom, Tawakoni, Travis and Whitney. The list has sometimes changed over the years. 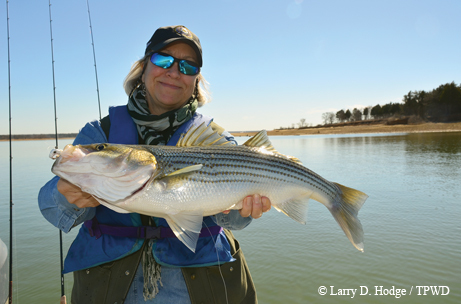 Lake Texoma was last stocked with striped bass fingerlings by Oklahoma in 1984 and 1985. Lake Buchanan maintains its outstanding striper fishery with annual stockings. For more information on striped bass, visit www.tpwd.state.tx.us/fishboat/fish/.